DON'T FORGET THAT FREE SHIPPING IS INCLUDED TO ALL U.S. LOCATIONS ON BOOKS!! SHIPPING ON TUBES IS FREE TO THE LOWER 48 ONLY! Free shipping on tubes, bells, etc. is limited to the "lower 48" due to shipping costs to AK, HI, PR, GU, etc. The extra charge is NOT a lot but please ask so I can tell you the amount! "The Pentatonic set is used primarily for rhythmic activities and games as all of the notes, played in any combination, sound good together...ergo, instant music. 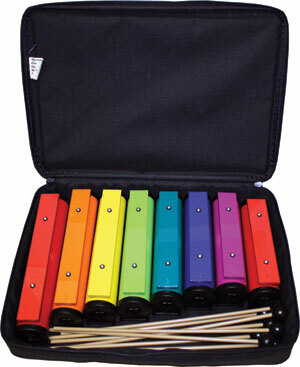 The Diatonic set is typically used for melodic activities (songs)....Of our 22 publications, the 3-volume Tube Time series was written for the Pentatonic set and is intended for use with younger kids. The 3-volume Totally Tubular series contains some activities which utilize the Pentatonic set, but was actually written for the Diatonic set. When facilitating a Boomwhacker activity with a large group of people (who may or may not be musically inclined) and with limited time, the pentatonic scale/set is often preferred because music can be created instantly using rhythm." For group activities, see the tab at the top right side of this page which will link to a guide on group use of Boomwhackers®. NOTE THAT THE "ULTIMATE PACK" AND THE "ALMOST ULTIMATE PACK" CAN NOT BE DELIVERED TO A PO BOX DUE TO THE SIZE AND COST OF SHIPPING. IF YOU CAN PROVIDE A BUSINESS DELIVERY ADDRESS THAT IS GREATLY APPRECIATED AS IT REDUCES MY COSTS. Even using UPS it generally runs between $30 and $50 to send these packages. The PO would be over $75 in most instances--they really don't like large packages!! Please note that Dad's Diggings, LLC is the parent company--and billing entity--for both www.boomwhackersandmore.com (where you are currently) and www.firststopmusicshop.com. "First Stop" offers music items (books, CDs, DVDs, reeds, strings and more) not related to Boomwhackers. Offerings include Mel Bay, Hudson Music, Alfred Publishing, Hal Leonard, D'Addario, Cavanaugh, Evans, Planet Waves and much more at very attractive prices. Stop in at First Stop and make it your LAST stop for music materials! To clarify a point of concern from some customers--both the XTS Whack Pack and the Dad Pack include ONE tube cap--I don't know why they only include one, but they do. The Boomophone™ XTS Whack Pack includes: 8-tube Boomwhackers® C Major Diatonic Set as well as the following: An Xylotote™ Tube Holder, Boomwhacker Whacker™ Mallets, the Whack-a-Doodle Doo! Songbook, ONE Octavator™ Tube Cap and easy to follow Instructions. Please also see the Dad Pack which icludes the second book at a reduced cost. Don't forget--my prices include FREE SHIPPING to the "lower 48." While others may charge as much as $50.00--PLUS shipping (usually $8 TO $10 dollars) we stand by our price--be a SMART shopper! The MOST POPULAR complete set--ready to go! Includes EVERYTHING needed to make music! NAMM 2011 TOOLS FOR SCHOOLS BEST AWARD WINNER!!!!!! Note that these sell for $6.95 plus $3.99 shipping on the Knowledge of Music website -- a total of 10.94. Here you pay only $8.00 including shipping -- a savings of nearly 30%. 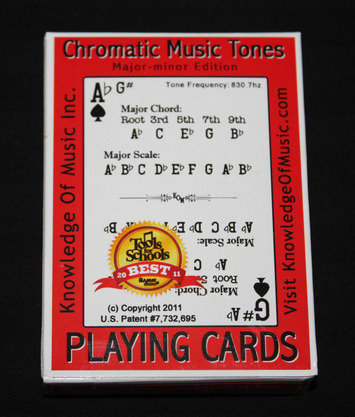 Knowledge Of Music Playing Cards, also known as KOM Cards, consist of a complete deck of playing cards with instructions, representing the four octaves of musical tones in the center of a piano; which incidentally are also all the tones represented on a traditional guitar neck. On each card face is the scale, chord and frequency of that tone. Black suits depict major scale and chord, red suits depict minor scale and chord. Also included are four Instructional Knowledge Cards and two Jokers. Included are instructions for play for Gin Rummy as well as Music Hand Ranks for play of Poker. These bells use the same color scheme as the Boomwhackers tubes for easy note recognition and classroom flexibility.